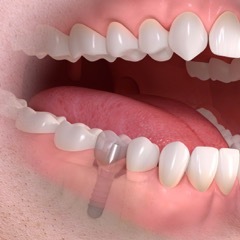 Dental implants are the ideal restoration for patients who are missing one or more teeth. At Tilden Dental Group, Dr. Jordan and Zachary Tilden work with a network of specialists to provide dental implants in the Streeterville neighborhood and the surrounding communities of Chicago. To schedule your dental implant consultation, contact our office today. Implants use three separate components to completely replace the structure of the natural tooth. The implant post itself is made using titanium, a biocompatible material that can be fully integrated into the structure of the jaw. The primary benefit of implant integration is that it prevents jaw resorption, and preserves the structure of the bone, creating long term comfort and preserving the shape of the face. Once the implant is placed, it will be capped with an abutment that allows the post to heal properly in place. Full integration into the jaw is followed by the removal of the healing abutment and the placement of a final abutment and the restoration. These restorations can range from single crowns, to bridges and dentures for multiple teeth. Implants allow our patients to experience the full function of restored jaw structure, second only to natural teeth. At Tilden Dental Group, we work with oral surgeons and implant specialists in Downtown Chicago to ensure safe, predictable, and effective placement of your implant. Our network of specialists each uses 3D cone beam scanning technology for guided implant placement. This 3D scanner allows our partnered specialists to take detailed images of your jaw for guided placement that ensures implants are placed in an optimal position to restore function and comfort to your bite. The restorations provided by our practice are fashioned from a variety of materials to fulfill patients’ cosmetic and functional needs. Ceramic crown restorations can be used to restore single teeth and can replace teeth in the front and back of the mouth. e.max crowns look natural and can be used as prosthetics for teeth throughout the smile. BruxZir crowns are made from solid zirconia and can withstand the substantial pressures of chewing, making them ideal to replace molars. In addition to the durable single tooth restorations, our practice also provides implant-supported restorations for patients missing multiple teeth. For patients missing rows of teeth, we can use two or more implants to support bridges, completing the aesthetic and functional balance of your bite. Our Chicago implant dentists also provide implant-supported dentures for patients missing a full or partial arch. To learn more about our implant-supported dentures, click here. Dr. Jordan Tilden, Zachary Tilden, and our team are dedicated to creating lifelong smiles through dental implants in Downtown Chicago. If you are missing one or more teeth and would like to schedule an implant consultation, contact Tilden Dental Group today.